Compare prices on car hire in Stoke from all the major brands and find the best deals. When you book through us, unlimited mileage and insurance are always included in the price given. 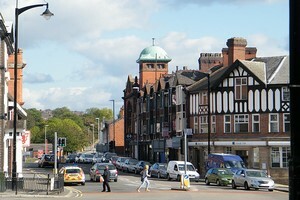 Pottery is important in Stoke-on-Trent and the industry stretches back to the 1500s. Visitors can get a better insight into the production and history by visiting one of the factories, galleries, centers or ceramic museums. In the many factory outlets can be the famous and beautiful items can be purchased, including brands Royal Doulton and Portmeirion. Stoke-on-Trent offers beautiful gardens and parks with various facilities. The whole family can take a trip to Alton Tower or Trentham Monkey Forest, which is a large park with lots of monkeys. Airport Manchester Airport is the nearest airport to Stoke-on-Trent and is approx. 40 km outside the city.